Following the destruction of four fleet vessels at the hands of the Omega Continuum, the U.S.S. Voyager and U.S.S. Demeter set course for a region of the Delta Quadrant far beyond any­thing previously explored. Captain Chakotay is determined to prove to Starfleet Command that the fleet’s ongoing mission is vital to Federation interests . . . and the key to doing so may lie in a distress call Voyager received nine years earlier but could not investigate. Meanwhile, Vice Admiral Kathryn Janeway is recalled to the Alpha Quadrant for an evaluation period to determine her next assignment. Given the trauma she has recently endured, Admiral Akaar, Starfleet’s commander in chief, is questioning Janeway’s fitness to command the fleet. Janeway’s primary concern remains the fleet’s safety— for their mission to continue, she must find a way to secure the resources they require. But the uncertainty of her superior officers has left her powerless to act in their best interests. “This is absurd,” Vice Admiral Kathryn Janeway said, crossing her arms and fixing her gaze on the streaks of starlight visible from the long bay window in Counselor Hugh Cambridge’s office. The counselor did not reply immediately, a tactic Janeway had become all too familiar with in the last few days of regular morning sessions with Voyager’s resident therapist. She didn’t need to turn back to know that despite her outburst, she would find him as she’d last seen him, resting comfortably in the deep black chair he favored, his long legs crossed at the knee, and his hands resting in his lap. His features would be placid, though occasional hints of ironic mischief would flash from his eyes. “Can they actually do this?” she demanded of the heavens. “Starfleet Command?” Cambridge replied drolly enough for Janeway to infer his meaning: How well do you know the lunatics currently running our high-tech asylum? A faint smile flickered too quickly across Cambridge’s lips for her to demote him for it on the spot. “You didn’t accept,” Cambridge replied. “They ordered me to think it over,” Janeway said. “And you excel at following orders?” Cambridge asked. “I do,” Janeway said, genuinely surprised at the implied criticism. Cambridge said nothing, obviously wondering if she was going to dig this hole any deeper before tossing her a rope. “What do they want from me?” Janeway asked. “How should I know?” Cambridge countered, matching her bewildered tone. “You’ve served under Admiral Montgomery for almost four years now,” Janeway shot back. Janeway paused for a moment to consider Admiral Kenneth Montgomery, who now held the future of the Starship Voyager, along with Galen and Demeter, in his hands. There was no denying that Montgomery and Janeway had begun their acquaintance at odds. But once the unpleasantness of Starfleet Intelligence Director Covington’s bizarre and reckless attempt to turn herself into a Borg Queen had been put behind them, they had certainly become allies if not friends. While he didn’t tend to reflect as deeply as she would have liked before taking action, Montgomery was hardly unreasonable and could be downright pleasant when the mood struck him. He had certainly seemed patient and understanding enough during their lengthy conversations of the past few days. “Maybe he changed his mind,” Janeway ventured. “A tall order, I’ll grant you,” Cambridge allowed. “You think that’s why the offer was rescinded?” Cambridge asked. “You just said . . .” Janeway began. Janeway did so, forcing herself to take the frustration now engulfing her and set it aside. Her breath settled into a deep slow rhythm, and moments later, a new thought jumped to the forefront of her mind. The admiral then took a few moments to visualize the current chain of command above Montgomery, and her heart stilled as she realized that the new order in question could only have realistically come from one place. “He is Starfleet’s current commander in chief,” Cambridge noted. “And those facts led Admiral Akaar to conclude that I am not capable of leading this fleet?” Janeway asked. “Put yourself in his shoes,” Cambridge suggested. “I realize I have made my fair share . . . all right, perhaps more than my fair share of questionable calls over the years,” Janeway allowed. “Yes, but that calculus might have changed a bit in light of some of the more far-reaching consequences of those choices,” Janeway added. “No, it’s an impossible one,” Cambridge insisted. Janeway shook her head. They’d already spent several hours discussing what Cambridge felt was her misplaced need to assume responsibility for the recent actions of the Borg that resulted in the deaths of sixty-three billion and the loss of hundreds of ships and several planets. There was no arguing that her choice four years earlier to destroy a transwarp hub in the Delta Quadrant seemed to have led the Borg to reconsider their tactics against the Federation and to target them for annihilation. But Cambridge had rightly pointed out that without a crystal ball, there was no way Janeway could have predicted that her choice would have such cataclysmic results. Based on the intelligence she had at the time, it would have been dereliction of duty for her to have refused to attempt to cripple the Borg, regardless of the eventual consequences. Intellectually, she could see his point. Her heart, however, remained unconvinced. Janeway felt heat rising to her cheeks but remained silent. “You don’t think I’m ready to lead this fleet?” the admiral asked. “I see,” Janeway said, placing her hands on the back of the chair opposite the counselor. Cambridge searched her face warily. “And did you, by any chance, share these thoughts with Admiral Montgomery or Admiral Akaar?” Janeway asked. Cambridge shook his head, clearly exasperated. “They didn’t ask, Kathryn,” he replied. “That’s . . .” she trailed off, unable to find the right word. “. . . troubling,” he finished for her. Rising, he moved to her side, and she turned to face him. “Someone up there has made a decision they believe to be final and are not the least bit interested in anyone else’s opinion on the matter. How they reached that decision is irrelevant. Be prepared to listen very hard, to what they say and don’t say. The truth will slip through the cracks somewhere. “But make no mistake. That can’t be your primary focus right now. Even after you left command of Voyager to Chakotay, you maintained what some might call an unhealthy attachment to your former command. You crossed lines few in your position would have risked for those you once led. You did it because you are constitutionally incapable of doing otherwise. But if you truly hope to lead them again, if you actually want this job, which I can’t imagine you could reasonably decide right now, you need to shift your priorities. “But I did,” Janeway said softly. “You will never again be the woman you once were. You have glimpsed yourself on a subatomic level. You have been altered forever by events both within and beyond your control. The mysteries of the universe, of existence, are no longer abstractions you can idly consider over drinks on a late night. They are staring you coldly in the face. They will not be ignored or postponed. There isn’t a clinical diagnosis that can contain the many levels of psychic stress you have endured or the emotional toll they have taken, never mind a treatment plan. You are now, much as you were when Voyager was first lost in the Delta Quadrant, countless light-years from your home. “Of course you do. You could march straight into Montgomery’s office the day you arrive and demand he reconsider. You could bully your way past the counselors assigned to evaluate you. You could make Akaar’s life personally and professionally miserable by reminding him and anyone else who will listen that you just saved this ship and the entire multiverse and that alone should earn you the right to do as you damn well please. Lieutenant Commander Thomas Eugene Paris entered Captain Chakotay’s ready room at precisely 0700 hours, as ordered. And that was no mean feat, given that his morning had started three hours earlier and consisted almost entirely of nursing his wife through her worst bout of morning sickness to date. Had Paris not seen it, he would never have believed it was possible for any individual to eliminate that much of anything from her body continuously and over so many hours. He had wondered, but not found the courage to ask B’Elanna, if one of the redundant Klingon organs was the stomach. If this morning was any indication, she must have six of them. Paris had finally prevailed upon her to go to sickbay, over her strenuous objections. He had then activated Miral’s holographic nanny to watch over her, hurriedly replicated a fresh uniform, and rushed to the ready room for his morning meeting with the captain. Thankfully, the thought of breakfast hadn’t even been tempting or he would have been late. He found Chakotay seated at his desk and staring out through the windows of the ready room, several padds stacked untouched before him. “Good morning, sir,” Paris greeted Chakotay briskly. As his captain turned to meet his eyes, Paris registered deep consternation tinged with a smidge of anger. “Chakotay?” Paris asked, dropping the official pleasantries at once. “We have a problem, Tom,” Chakotay began. When isn’t that the case? Paris thought, but was wise enough to keep to himself. Instead, the first officer did a quick mental inventory of the ship’s status, ongoing personnel issues, pending duties, last-known orders, and came up with absolutely nothing to account for Chakotay’s mood. True, in a few hours, Voyager would arrive at New Talax to regroup with its last remaining fleet vessels, the Galen and Demeter, and a few hours after that, a lengthy memorial service no one could be looking forward to would begin. But Chakotay had spent the last few months in Voyager’s center seat turning calmness in the face of chaos into an art form. And less than two weeks ago, he had unexpectedly been reunited with Admiral Janeway, the only woman Paris believed Chakotay had ever truly loved, and whom all of them had thought dead for the last year or so. If anything, this unlikely turn of events had seemed to deepen Chakotay’s reserves of strength while bringing a new and healthy light back into his eyes. “What happened?” Paris asked, when his best efforts came up empty. Chakotay clasped his hands before him and began to knead them, as if he could force some insight from them. “We have new orders from Starfleet Command,” Chakotay replied. “Okay,” Paris said, wondering how bad this could possibly be. Paris’s stomach turned so hard he was grateful it was empty. “I thought they had offered her command of the fleet,” he said. “So . . . she passed on their offer?” Paris ventured hesitantly. “Then this isn’t Admiral Janeway taking some much-needed and well-earned rest,” Paris realized. Chakotay’s eyes met Paris’s, searching them with the precision of a laser scalpel. “Then I don’t understand,” Paris admitted. The first officer made his way up the low step into the seating area where he had an unobstructed view of streaking starlight. Not that much less, Paris thought, but held his peace. “No,” he replied as if offended by the thought. The captain stepped back from the railing and began to pace the small area before his desk. “We need to avoid any appearance of impropriety or renegade impulses. We need to demonstrate to Starfleet that we take our responsibilities seriously and that we can play by the rules. But we also need to show Command that continuing to explore this quadrant is a worthy investment of time and resources. “So no baby stars, uninhabited systems, or interesting nebulas?” Paris quipped. “First contact would be nice,” Chakotay mused. 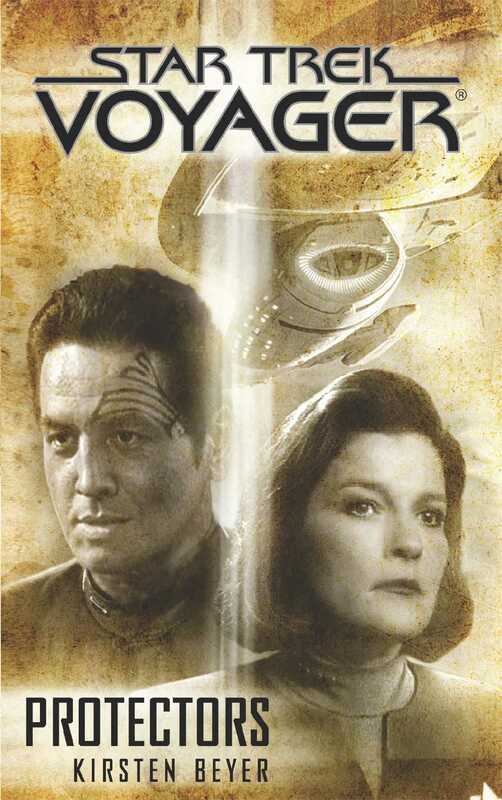 “Not everybody called us the ‘ship of death.’?” Chakotay smirked. “No, just the ones who survived our first visits.” Paris chuckled. “You know what I mean,” Chakotay insisted. “Don’t you just love being first officer?” Chakotay teased. Paris considered testing the waters but honestly no longer had the patience for anything less than a reckless dive. “Without the admiral,” he replied. Chakotay might have punched anyone else for insubordination at this, but coming from Paris, who had come painfully close to losing his wife and daughter, it was a fair question. “No, it isn’t,” Paris agreed. As Paris crossed to the door to begin what was going to be a much busier day than he hoped for when he arrived, Chakotay called after him. “Good. As you were.” Chakotay dismissed him. Paris continued out the door, slightly chagrined at withholding his and B’Elanna’s happy news. Paris had only known for a few days that his family was about to get a little bigger, and B’Elanna had forbidden him to tell any of their friends for a few more weeks. It was an understandable request, but Paris couldn’t help but think that especially today, Chakotay could have used a little good news. Still, he was determined to provide the captain with some by the next morning, come what may. “The proper term is hyperemesis gravidarum, Commander,” Doctor Sharak said in his most soothing voice. Lieutenant Commander B’Elanna Torres responded by heaving once again and depositing the results in a small basin Sharak had offered her the moment she had entered sickbay. “Don’t . . . care . . . what you call it . . .” B’Elanna finally said through ragged breaths. The last several hours had sapped every ounce of strength she possessed. “Just . . . make it . . . stop,” she finished, and punctuated the thought by retching again. Exhausted and dispirited, B’Elanna lay her head against the inclined biobed. “Do your people have a position on euthanasia?” she asked. B’Elanna turned her head to make sure Doctor Sharak knew that last question had been her extreme distress talking and not a serious request. Although he was the first Tamarian she had ever met and the nuances of the expressions of his wide, dark-brown mottled face were often difficult to decipher, an assured smile and twinkle in his eyes put her fears to rest. “You mean to tell me we can communicate via subspace, create warp fields, dematerialize and rematerialize complex matter at will, and manufacture weapons that operate in multiple phase states but Federation medical science still hasn’t cracked the code on morning sickness?” B’Elanna demanded. B’Elanna paused as Sharak’s words finally registered. “My son’s heritage?” she asked. “It’s a boy?” B’Elanna asked as wonder momentarily replaced her general misery. The fleet engineer’s stomach heaved again, and she immediately rolled to her side and grabbed the basin. When the sensation had subsided, she sat back and replied, “It’s okay.” Placing her hands protectively over her belly that had yet to show even a hint of rounding, she imagined the look in Tom’s eyes when she told him they were about to have a son. It more than made the last several hours worth it. Like most expectant mothers, B’Elanna had been hoping for ten little fingers and ten little toes. The rest, including the child’s gender, was gravy. But something in the knowledge that this was her son, Tom’s son, filled her with awe. It’s going to be okay, my little man. Your mom is a Klingon warrior. I’ve been through worse. Lieutenant Harry Kim, Voyager’s security chief and tactics officer, was pleased with his handiwork. He stood beside the chief engineer, Lieutenant Nancy Conlon, and Seven of Nine in what had once been cargo bays two and three. For the time being, they had been merged into one vast compartment, empty but for a newly erected command console and the presence of dozens of specially designed holographic generators. “Let me see it one more time?” Kim asked. Conlon and Seven exchanged a knowing, weary glance, but the lieutenant complied without comment. At her command, the bleak gray bulkheads were replaced by a large reception hall decorated in somber earth tones. A small raised area at one end had been designated for representatives from each fleet vessels, save Plank’s, whose loss had already been memorialized. The rest of the space was filled with rows of long, low, cushioned benches running the length of the room, on which the surviving crews from the vessels Voyager, Quirinal, Esquiline, Hawking, Curie, Achilles, Galen, and Demeter would sit during the formal part of the ceremony. “And the park?” Kim requested. In a flash, the interior location shifted, and the same dais and benches sat in an open-air recreation of Federation Park in San Francisco at night. This would be used for a brief time at the end of the service. Once it was done, the space would be reset to an interior but populated by casually arranged tables and chairs to allow the various crews to interact more personally. Kim and Conlon, with Seven and Paris’s help, had spent the last several days considering the most appropriate and personal forum in which those who had served together but a few short months and had recently been separated by tragedy could come together as a fleet to commemorate the lives of those lost. It had been Conlon’s suggestion to make contact with the survivors who had hastily returned to the Alpha Quadrant less than a week ago and hold the service together in real time using the communications buoys the fleet had launched when they first arrived in the Delta Quadrant. Kim had initially envisioned mounting ceiling-to-floor viewscreens to create the illusion that those assembled were sharing one space. It had been Seven’s suggestion to simply create a holodeck large enough to house Voyager, Galen, and Demeter’s two hundred plus crew while simultaneously allowing them to actually interact directly with the more than seven hundred who would be gathering in the Alpha Quadrant. This minor miracle could never have been accomplished without the assistance of the officers at Project Pathfinder who had worked years earlier to reconnect Voyager with the Alpha Quadrant when they had been lost in the wilds of the Delta Quadrant. Although Pathfinder’s work had been refocused when Voyager first returned home, many on staff there now still felt a certain kinship with Voyager’s crew, and a small contingent had been assigned to monitor the fleet’s relays and enable continuous communications capabilities when the new fleet had launched. Seven had made direct contact with an old acquaintance, Commander Varia, and he had dropped everything to assist her in making the necessary preparations from his end. Real-time holographic communications of this size had been reserved for only high-level meetings of Federation and Starfleet authorities. When Kim and Seven had briefed Varia on their intentions for the service, he’d agreed it was possible, and in this case, absolutely appropriate. “Do you think we should . . . ?” Kim began. “I’m not contacting Varia again, Harry,” Conlon cut him off. “The relays are stable. We’ve already tested the matrix fifty times, and everybody who will be running the technical side of this thing knows their job. We’re ready,” she assured him. “Seven?” Kim asked, hoping she might countermand Conlon’s completely accurate assessment. “While I am a little concerned at fluctuations in relays nineteen and twenty-six’s power levels, we can bypass them if necessary,” Seven replied. “Are they still acting up?” Conlon asked, double-checking her own console. “We are ready, Lieutenant Kim,” Seven said. Kim nodded. While he took a moment’s pleasure in the results of their labors, certain that in a few hours hundreds of men and women now separated by more than twenty-thousand light-years would, for a short time, believe that they were standing right beside one another, that happiness was too quickly replaced by the unavoidable heaviness of the circumstances that necessitated their gathering. “Okay,” Kim agreed. Now, he only looked forward to the evening’s end, when he could tear the thing down and begin the much more difficult process of putting the devastation of the last few weeks behind him.